Cardinal Sean O’Malley, at the bishops’ meeting. O’Malley, in an interview Monday during the annual gathering of US bishops, said the church is often seen as more engaged in “culture war” issues such as abortion and gay marriage than in caring for the impoverished. That perception — which O’Malley said may be driven by those who want to distort the church’s image — must be corrected, he added. 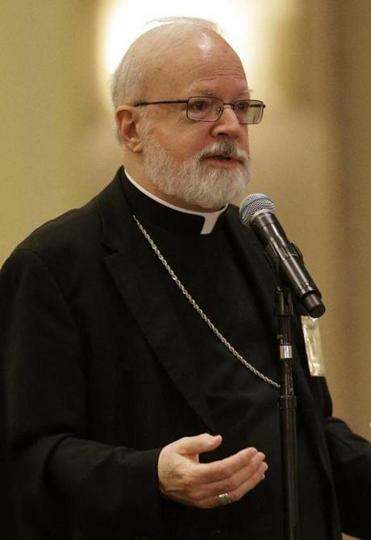 At the bishops’ annual fall gathering Monday, liberal Catholic groups called on US prelates to heed Francis’ call to emphasize the broader Gospel teachings of compassion and mercy rather than specific teachings on abortion, homosexuality, and contraception. Critics of the bishops say they have allowed those issues to eclipse economic and social justice in recent years. O’Malley said the idea of a campaign to raise awareness around poverty may be “something that the church needs to look at,” but the church has always been far more involved in health care, education, and social services than in constitutional issues. He said he remains concerned, though, about the health care law. The bishops are trying to figure out what to do when the law takes effect Jan. 1. And yet, he said, there is a danger in allowing any erosion of religious liberty. He said, in any case, the church should not remain silent about its moral teachings. Although some gay Catholics have urged the bishops to end their campaigns against gay marriage in light of Francis’ words, for example, O’Malley said the church should not stop opposing gay marriage. But he stressed that gay people are “always, always, always welcome” in church. “We don’t propose that as a way of trying to diminish the dignity of a homosexual person, but we really see [heterosexual marriage] as very important for family and for society, and it’s the optimal way to do it,” he said. O’Malley, as the blog Whispers in the Loggia reported, considered proposing the creation of a political action committee to help the church more effectively explain its teachings in the public square. But in Monday’s interview, he said he nixed the idea, saying the bishops could be seen as overly political. O’Malley said he hopes advocacy groups will do the work instead. O’Malley has become an increasingly significant figure in the US church since the conclave to choose a new pope in March, when he captured the hearts of many Catholics as a dark horse papabile, or potential candidate for pope. Pope Francis signaled his trust in the Capuchin Franciscan friar by naming him to a council of eight cardinals to advise the pontiff on reforming church governance. O’Malley is the only American in the group, which held its first meeting in Rome last month. Its first task is to rewrite the constitution of the curia, the bureaucracy of the Vatican, which has been plagued by scandal. It was partly because of this new responsibility that O’Malley, who in addition to running a large archdiocese is also chairman of the bishops’ Committee on Pro-Life Activities, said he declined a nomination by his fellow bishops to be president of the US Conference of Catholic Bishops. The bishops will choose a successor to Cardinal Timothy M. Dolan of New York, outgoing president, by secret ballot on Tuesday. Asked about Martin J. Walsh, Boston’s cardinal said he was happy that Boston’s mayor-to-be has a good rapport with minority communities and that Walsh had been “very supportive” of Catholic schools.